Having a favorite book is wonderful and joyous, but what happens when you can’t find your book? 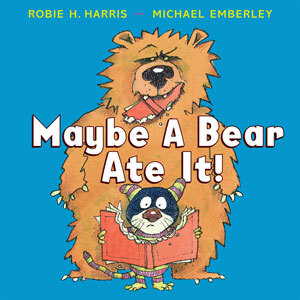 This month’s featured book, Maybe A Bear Ate It!, by Robie H. Harris, shows us the power of imagination, the joy that books can give us, and makes us wonder: do bears eat books?! Invite your child to talk about books. “Tell me about a book that you like.” Tell your child about your favorite book too! to show you the pictures that are inside. Let’s read the words that are inside! Some of the pages in Maybe a Bear Ate It! are wordless. The fun illustrations help tell the story. Tip 1: As you read the book, pause at each page and tell your child about what is happening. As the story becomes familiar, let your child narrate. The little creature loves to read! Help your children discover their favorite books by visiting your local Pima County Public Library! Activity 1: Invite your child to play pretend! Take turns pretending to be the little creature and animals to retell the story. Be silly and have fun! Activity 2: Repurpose a discarded shoe box or cereal box into a book box! Let your child decorate the box to add their own pizazz. Having a special place for books will help prevent them from being lost, and keep precious books safe from hungry bears. Send us a video of you sharing the book together. Send us a picture of you and your child with the book. Send us a picture your child drew about the story. Be creative! We can’t wait to see what you loved about Maybe a Bear Ate It!